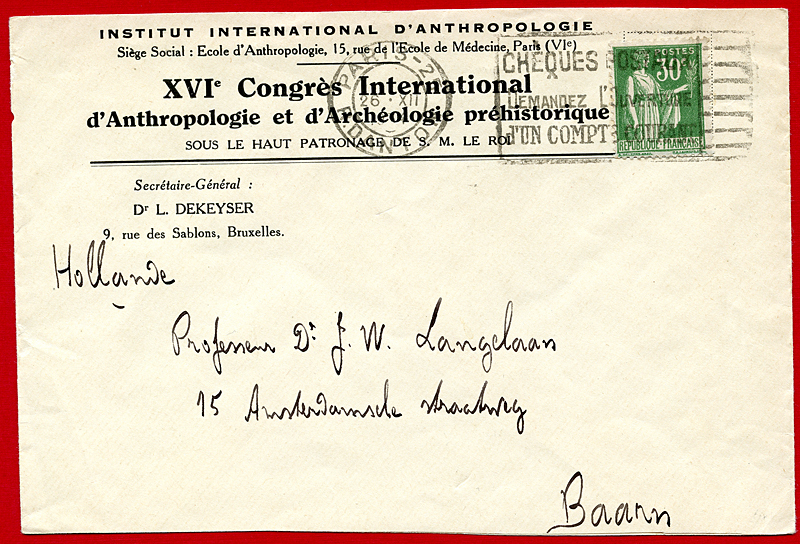 A service cover from the Secretary General of the XVI (16th) International Congress on Anthropology and Prehistoric Archaeology held in the Paris, France School of Anthropology. Cover is dated 26 December 1934 – what a wonderful Christmas present that would have been! Vernal is a small city in the Ashley Valley of the Unitah Mountain range which lies in the northeastern corner of Utah. The area was inhabited in prehistoric times by dinosaur giants and today is the site of tourism as it is near Dinosaur National Monument on the Colorado border. Contract airmail was instituted through the Airmail Act of 1925 (Kelly Act) which authorized the U.S. Postmaster General to contract with private airlines to carry the U.S. mail. 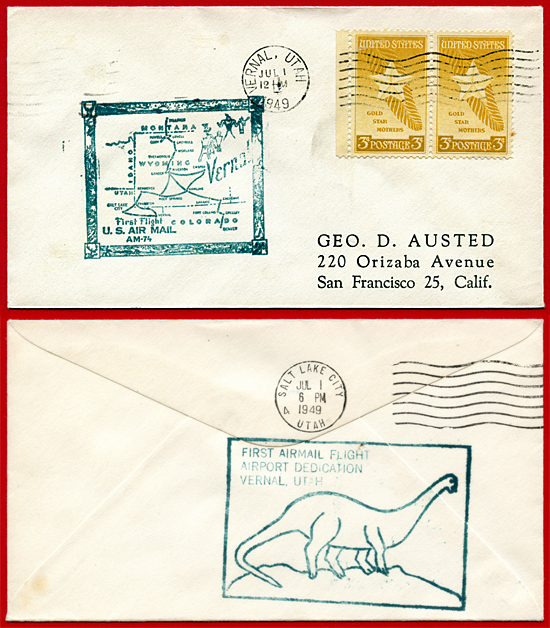 Routes were given Contract AirMail (CAM) numbers and awarded to various airlines. Served by the Vernal-Unitah County Airport, Challenger Airlines was awarded Contract Airmail route number 74 on May 10, 1947 with service to various cities in Colorado, Utah and Wyoming. Service to Vernal was initiated on 1 July, 1949 with two routes – one to Salt Lake City to the west and a second to Evanston to the northwest. The flights connecting from those cities took the mail in all directions. Special First Flight Cachets were instituted to mark the initial flights and in the case of Vernal, a local hand-stamp was used commemorating the airport dedication as well. This hand-stamp is found on the rear of envelopes and is present on covers carried on both routes. The northwest route morning flight was postmarked at 7AM and piloted by R.D. Nicholson. Addressed to Philadelphia, PA, this cover used the northwest route through Evanston and was backstamped along the route at Rock Springs, Wyoming at 10:30AM. The westward route afternoon flight was postmarked at 12PM piloted by Harry Mitchell. Addressed to San Francisco, CA, this cover used the western route through Salt Lake City and was backstamped along the route at Salt Lake City at 6PM. The ‘Century of Progress International Exposition’ was held during 1933-1934 in celebration of Chicago’s centennial. Also known as the Chicago World’s Fair, the most advanced technology available was on display for the pleasure of attendees. 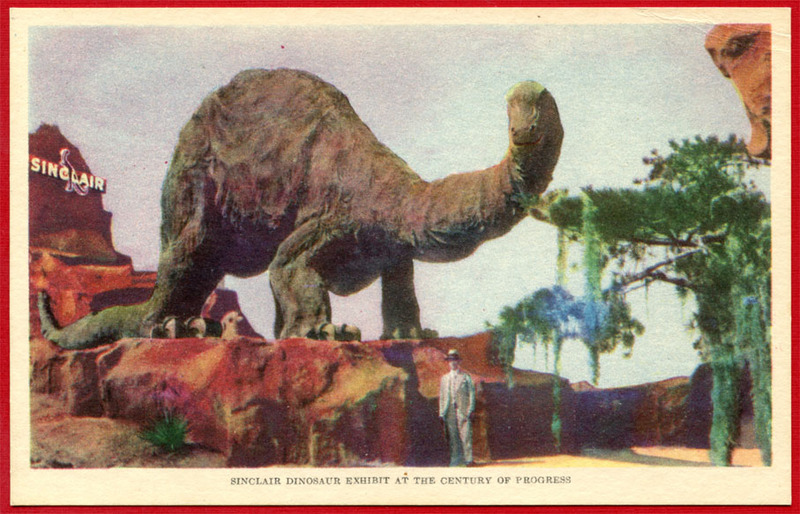 One of the more popular pavilions was Sinclair Refining Company’s 2 ton, animated exhibit of ‘Dino the Dinosaur’. The intent was to associate the origin of the product’s raw materials with vast age, insinuating it was better quality. People could not fathom how large these animals really were until they stood near this giant and even then, it was difficult to believe. 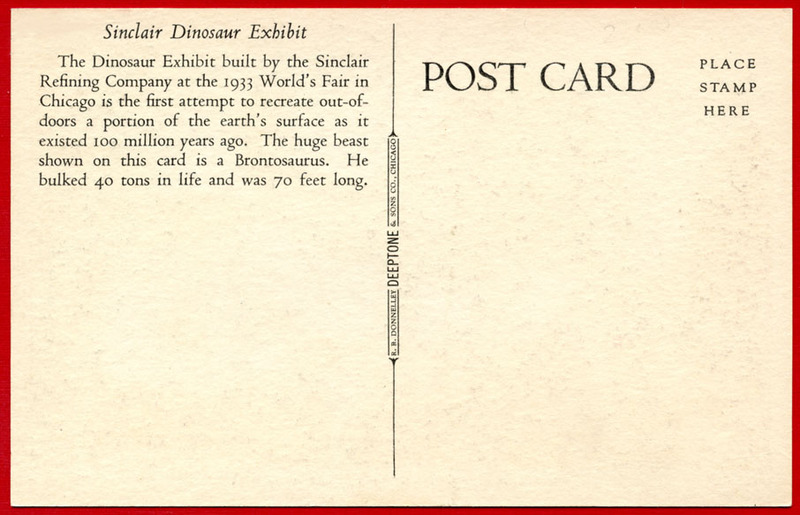 The dinosaur’s popularity resulted in the company’s use on mail advertising beginning the same year in the form of Sinclair Dinosaur Illustrated Postage Meter Slogans. This post card, printed in DEEPTONE color by R.R. Donnelley & Sons Co., Chicago, was an opportunity to use the public’s fascination with dinosaurs as free advertisement for the company. I was told many years ago that a second post card exists with a similar design but I’ve never seen it in the 50 years I’ve collected this material. 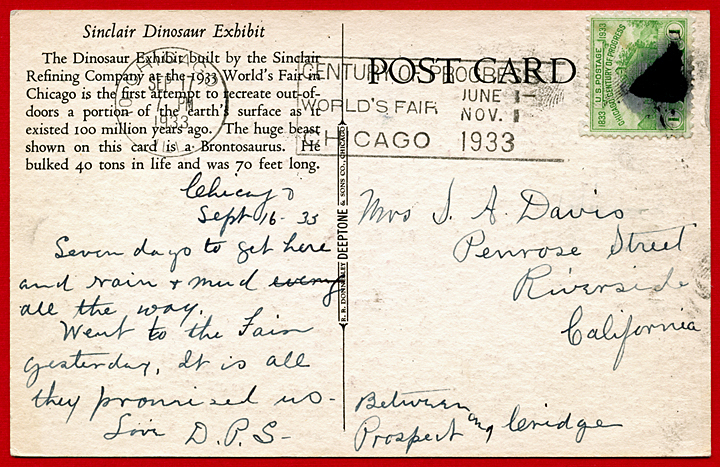 The real treasure when it comes to this post card however is an example of one actually mailed from the exposition’s post office – what a wonderfully exciting find this was! Stegodon ganesa was an ancient cousin of mammoths and modern day elephants. The name Stegodon means ‘roofed tooth’, and referred to the shape of the teeth resembling a roof. Stegodons, there were several sub-genus, lived in many parts of Asia, from the Indian subcontinent to as far east as Japan. Fossils have been found that date the animal’s existence up until the Pleistocene. The Geological Survey of India, founded by the Coal Committee of the British East India Company to explore and record the mineral resources of India for further development, was commemorated with a stamp issue in 1951 depicting the Stegodon ganesa. 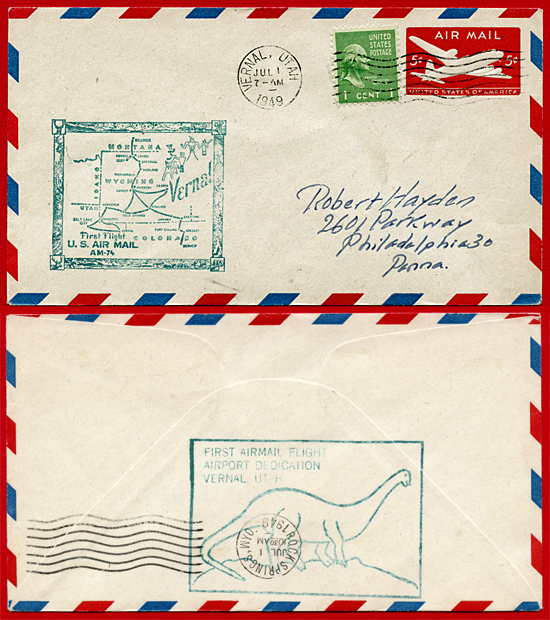 This cover bears a commercially used pair of the 1951 issue. 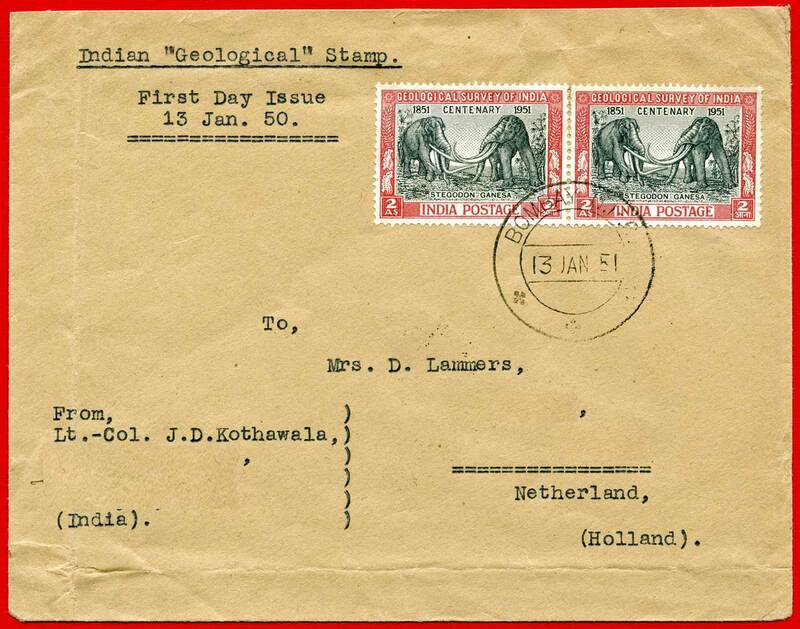 It was mailed on the first day of issue (Jan. 13 1951) from Bombay, India to Dalfsen, Netherlands at the first class international surface rate of four Annas. The typewritten text in the upper left indicates the year as 1950 – which is a typographical error. This stamp has the distinction of being the first postage stamp to depict a reconstruction of a prehistoric animal.